The bi-annual Report to the Nations released by the Association of Certified Fraud Examiners (ACFE) conveys data regarding (among other things) fraud losses by industry. One of the industries where a high volume of fraud cases have been reported in the ACFE studies is healthcare. 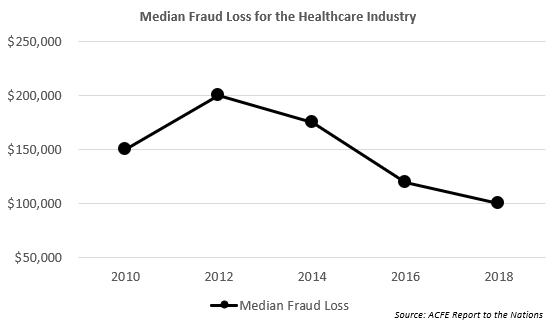 In the past five studies published by the ACFE, the median loss per reported fraud case in the healthcare category ranged from $100,000 to $200,000, not an insignificant amount for many healthcare businesses. So, what types of fraud schemes are giving rise to these losses? For the reported cases in the healthcare category, most frequently it was corruption, which was present in 36% and 31% of the healthcare frauds reported in the 2018 and 2016 studies, respectively, and billing schemes, which present in 26% and 31% of the Health Care frauds reported in the 2018 and 2016 studies, respectively. Other top fraud schemes reported for the healthcare category included payroll, expenses reimbursements, and non-cash schemes. To learn more about our fraud investigation capabilities, or if you feel that your organization may be the victim of a fraud, contact Brittany Garver or Bill Foote at 301.231.6200. Questionable Transactions, What Could It Be and Are They Deductible?